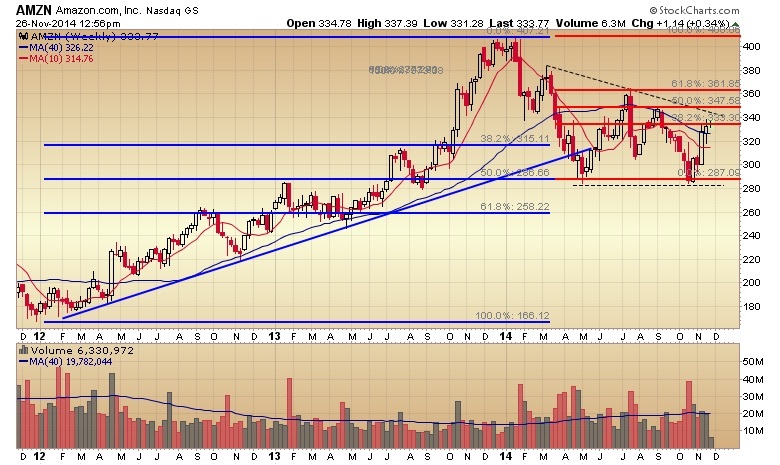 Shares of Amazon (AMZN) have been trading within a set of Fibonacci retracements measured off their 2014 range. The January to May decline found support at the 50% retracement level of the 2012 low and the 2014 high, setting the range for this year and a platform for a bounce to the July high. 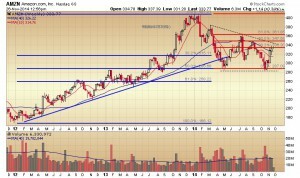 The move was halted at this year’s 62% retracement level, and the stock price dropped sharply over the next two weeks. It attempted another advance, this time meeting resistance at the 50% retracement level. The subsequent move down to the October low held at the May low, and the rally that has followed is now up against the 38% retracement level. This process of making lower highs above six month support has formed a descending triangle pattern. It remains to be seen if this last Fibonacci retracement level will hold and set up another move lower to test the support line or it will be broken and triangle resistance taken out, which would project a pattern price target to new highs.